Maddness. Community Funday- organised in a week? Synopsis: A community Gala in a week! No way! As a team we will have a ball… sorting out the community Gala for Saturday in the park. We will work on fresh ideas and hear from the Spirit as to how we can impact the community in a highly visible grace soaked and powerful demonstration of the Kingdom. Be prepared to work hard and play hard! Discern how a community Gala falls within an evangelistic strategy for our own communities. Listen to God as to how to creatively reach out to people. 2.00-3.00 Speak Lord! In the park with trays of goodies. 3.30-5.00 Get set and go! As a team we will need to touch base on Wednesday, Thursday and Friday at 7pm before the evening event. As well as receiving we have an opportunity to pour out that which is poured into us. Be ready to win the lost. Be ready to match the ‘message with the vehicle’ and show the gospel to people. Be ready to do new things. 3) The Spiritual temperature of the community is raised. 4) People are brought from no knowledge and being antagonistic to being able to teach and enthusiastic. 5) The Saints and the not-yet saints are mobilised. 6) People encounter Jesus in lots of different and diverse ways. 7) The Church positively engages with community groups, police and businesses. The message with the means in which it is delivered match. I believe that we need to integrate the good news of Jesus with how we share it. The good news told angrily, shabbily, unkindly or confusingly isn’t really good news at all. Matching the message with the way it is communicated is vital for people to connect with what we have to say. Jim Wallis wrote that people should begin to understand what the gospel is all about by observing the way we are. [i] We cannot divorce what we believe and how we live. I believe that each one of us must be able to communicate what we believe in our own unique way for the sake of those who only know about being a Christian from the weird portrayals they see in popular culture. We are each gifted differently—some of us creatively, some with words of knowledge—so that people may have an opportunity to connect with the message. In my burning desire for people to hear the good news about Jesus, I realise that there needs to be a ‘connection’ between what I say—my desire to proclaim the gospel—and how I talk to strangers on the streets. Giving thing away for free is one way in which I have connected what I say with how I say it. Last Easter I and a team of people set up a barbeque in the middle of the city and in three days, toasted 4,000 hot cross buns. In the process, we spoke to hundreds of people about the good news of Jesus and his death on the cross for each one of us. Demonstrating the message with a free gift meant that people listened and responded. In an age where less and less people come to events and Church, (the in-drag!) the going principle works well. 3. The Spiritual temperature of the community is raised. Prayer on one hand, evangelism in the other. Free healing or free horse ride? Free balloon or free dream interpretation? 4. People are brought from no knowledge and being antagonistic to being able to teach and enthusiastic. The lower-left gray oval shape represents a group of people who are fairly resistant and lack knowledge. The challenge to us is always to use approaches which reach down as far as we can into the bottom left-hand corner. If people are near the bottom of the scale, we must not use Christian language and ideas which will mean nothing to them. In fact we must assume they have zero knowledge. We must assess our message through their eyes, not ours. It may also be inappropriate to give a heavy ‘preach for a decision’ at this point. 5. The Saints and the not-yet saints are mobilised. People who are Christians will do something. 6. People encounter Jesus in lots of different and diverse ways. Mark Stibbe identifies 7 types of evangelism- many of which can be seen in a community Gala. “When you enter a house, first say, ‘Peace to this house.’ 6If a man of peace is there, your peace will rest on him; if not, it will return to you. Go rather to the lost sheep of Israel. As you go, preach this message: ‘The kingdom of heaven is near.’ Heal the sick, raise the dead, cleanse those who have leprosy, drive out demons. Freely you have received, freely give. 7. 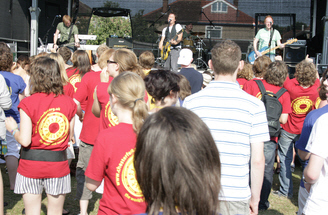 The Church positively engages with community groups, police and businesses. ‘Unsaved people’ are not the enemy. The openness and ‘this is what we believe’ approach is well received. The aim of Redeeming our Communities is to be a catalyst for community transformation by promoting partnerships which open up more opportunities for crime and disorder reduction, and enhanced community cohesion. We bring together churches, the police, the fire service, local authorities and voluntary agencies to encourage them to work together in positive partnerships for practical change. As a result, statutory agencies have improved access to the support of church groups, and thousands of Christians are enabled to better serve the needs of their community. This approach, pioneered in Manchester since 1998, has seen crime fall and fresh hope brought to some of the bleakest parts of the UK. Statutory authorities and agencies working in the local community are tapping into the support, expertise and resources we provide, and community groups are adopting proven social transformation strategies from across the country. The challenge. We have at our disposal: the wealth and power of Christ in us and of other delegates at the School of mission. His presence and life in our midst. We have an afternoon, a host of volunteers and a park. We also have a small budget. What will we do?! [i] Wallis J (1981) The Call to Conversion, USA: Lion Publishing, p. 108. Rev Dr John Stott has completed his final public engagement, asking, “What is God’s purpose for his people?” as he spoke at the Keswick Convention 17 July. by Daniel Blake, Posted: Thursday, July 19, 2007, 15:02 Christianity Today . Used by permission. The community Gala worked. Around 300 people came alonge and enjoyed the free bouncy castles, face painting, dream interpretation and spiritual readings, cafe area, balloons and loads more. It was a great time. So good.